Peel and cut carrots and potatoes into bite-sized pieces. Thinly slice cilantro. Mince onion, garlic, chili, and ginger. In a large saucepan, sauté onions, garlic, chili, and ginger over medium heat until golden brown. Add potatoes and carrots and sauté for approx. another 4 – 5 min. Add lentils and sauté for a further 2 – 3 min. until they are slightly translucent. Add tomato paste and spices and, stirring constantly, sauté for approx. 1 – 2 min. until fragrant. Deglaze with vegetable stock and season with salt. Bring to a boil, turn heat down to low, and let simmer for approx. 15 – 20 min. or until the lentils are soft. 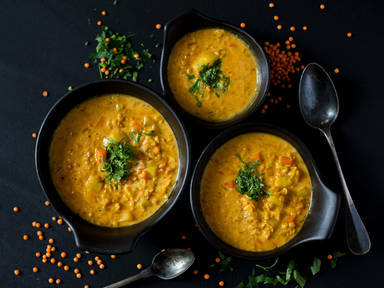 Incorporate coconut milk into dal and reheat. Season to taste with salt, sugar, and lemon juice if desired. Garnish with cilantro and serve together with homemade naan.